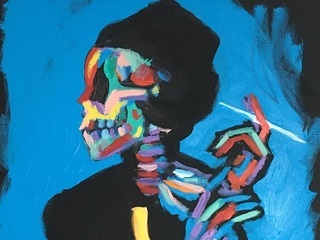 Early Tuesday morning, at around 2:45 a.m., a patron of the Dream Downtown hotel in Chelsea helped themselves to one of the items of an upstairs lobby exhibit by street artist Bradley Theodore. A fanciful portrait (pictured) of Diana Vreeland, who was the editor in chief of Vogue magazine from 1962 to 1971. “He [the thief] was ballin’ at PHD and jacked my painting at the end of the night! Those drinks ain’t cheap,” Theodore said. Did the thief sober up and realize the error of his drunken ways? Apparently, he paid for his bar tab with a credit card and was caught on camera, so we should soon be learning the rest of this story. Check out more of Theodore’s work here.